promotion campaigns that appear to be socially critical. But the internationally operating company is itself involved in dirty deals. In south Argentina, Benetton has bought almost one million hectare of land. The local population, mostly Mapuche indigenous people, are forcefully removed from this area. They are calling for solidarity and action against Benetton. Mapuche challenge Benetton once again. LA PAZ, Bolivia - When Rosa Rua Nahuelquir moved with Atilio Curinanco onto a plot of Argentine land called Santa Rosa, she didn't expect to start a four-and-a-half-year battle with clothing giant United Colors of Benetton. Now the evicted Mapuche woman has returned to Santa Rosa, with 30 other Mapuche. This time the Mapuche say they are there to stay. On Feb. 14, men, women and children from the surrounding region climbed onto trucks and hitched rides at dawn to the 17- acre plot, planting flags and setting up tents. ''We have returned to our ancestral territory to keep developing the philosophy of life that our ancestors have left us,'' they said in a declaration released after the occupation. On Feb. 18, an arts festival brought Mapuche and non-Mapuche together. Nahuelquir said the group was planning to first build a community center and then houses for each family. ''My eldest son is asking that we live in peace here,'' she told reporters from Indymedia. Benetton has not issued a statement and did not return requests for an interview. A Feb. 21 article in the Argentine paper La Jornada reported that Benetton had reversed its original decision to evict the group. Curinanco and Nahuelquir sparked the conflict with Benetton when they moved onto the land in August 2002, after being told by the Argentine government that the plot was ''public land'' - which in Argentina means anyone can stake a claim. But Benetton informed them the land was theirs and had them evicted the following October. Mapuche and non-Mapuche rallied in favor of the couple, and Mapuche delegations went to Italy to meet with Benetton. However, in June 2004, the Argentine government ruled against the couple. The clothing company claimed they got stuck in the middle of the real war, which was between the Argentine government and the Mapuche. Historic evidence certainly supported their claim. During the 19th century Desert War, which pitted the Argentine government against the Mapuche, thousands of Mapuche lost their lives. wei'' (''victory a thousand times'') rang out on both sides of the Andes. By the time Curinanco and Nahuelquir left the nearby town of Esquel for what they thought would be a better life in Santa Rosa, the Mapuche had gained political experience battling oil, logging and tourist companies in Chile and Argentina. They had sharpened a variety of weapons - lawsuits, alliances with European indigenous groups like the Catalans and the Basques, demonstrations and hunger strikes. When they had to, they did it the old-fashioned way - encircling their territory on horseback and lobbing stones from the leather boleadoras they swung over their heads when armed police attempted to make more room for the multinationals. They were met with imprisonment, eviction and death. Oil was spilled, water contaminated and children sickened. The Mapuche of one Argentine community brought a $445 million lawsuit against the Spanish oil company Repsol for environmental contamination and health damage after they were no longer able to drink their own water. Most of these battles were fought ''in the dark,'' as far as world publicity was concerned. Then along came the Benetton eviction notice. The Italian company is currently one of the largest landowners in Argentina, with 2.2 million acres of land, most of it devoted to cattle and sheep farming. Benetton had won its high-profile image through an artful advertising campaign using photographs of people of all races posing together. While it worked through the court system to evict the Mapuche, it also tried hard to maintain its progressive image despite increasing adverse publicity. The issue was further exacerbated by the eviction of a nearby community of eight families to make way for a tourist museum planned by Benetton. Argentine Nobel Peace Prize winner Adolfo Perez Esquivel assisted the Mapuche by writing letters on their behalf to Benetton. In 2004, the company offered 2,500 hectares of land in another region to the Mapuche but the Mapuche refused the offer, saying the land offered was not productive. They wanted to stay in Santa Rosa. By now it wasn't just a question of one Mapuche couple who wanted to make a better life for themselves; it was a call from the ancestors. The Mapuches' confrontation with Benetton over Santa Rosa is not the only battle being fought on the land where their ancestors once walked. In Chile, Mapuche are being tried as terrorists and state police are routinely denounced by the Mapuche for brutality against them. Argentine Mapuche continue to clash with oil companies and tourist developers. Increasingly, the spectacularly beautiful Patagonian land is being bought up by wealthy foreign individuals like Ted Turner, who owns over 100,000 acres, and Ward Lay (of Frito-Lay), who runs a hunting and fishing resort on 200,000 acres. On their recently occupied 17 acres, the Mapuche have asked their neighbors for donations of wood, nails and other material to help build the houses and the community center of the new community they have named Santa Rosa-Leleque. This new community, Millan said, would be important for both Mapuche and non-Mapuche. ''We are not going to have a community here that is going to be divided by barbed wire. On the contrary, we want it to be open to the general society. BUENOS AIRES, Feb 27 (Tierramérica) - Mapuche Indians in the southern Argentine region of Patagonia, who in 2002 took part in a land dispute against the Italian textile group Benetton, have returned to occupy land belonging to the firm, reclaiming their ancestral rights. "This is not a protest, nor is it a clandestine action. We don't intend to be owners, but rather to live as a community in our territory," Mauro Millán told Tierramérica. He was acting as spokesman for the 25 Mapuches who since Feb. 14 have occupied the Santa Rosa farm in the southern province of Chubut in Patagonia. There are six families building homes there, near the site from which they were expelled five years ago. Santa Rosa, covering 534 hectares, is on the Leleque ranch. In 1991, Benetton acquired the Compañía de Tierras Sud Argentino (CTSA), dedicated to agricultural production, which included Leleque and other ranches in the province. In one section of the ranch, Benetton opened the Leleque Museum in homage to the region's indigenous peoples and pioneers. But the Mapuches say they do not want to see themselves portrayed as "trophies of one culture that destroys what is different", and they claim their right to the land. The attorney general's office in Esquel, the closest city, last week filed a claim of misappropriation. But spokespersons from the firm told Tierramérica it was a government claim. The company has not yet determined a legal course, because it considered the case closed. The new community says the territory belongs to them since before the CTSA was created and that the seizure comes from that period. "This for us is a return to a common territory of the Mapuches. There are old cemeteries of ours there," said Millán. "Since our land was usurped, the landowners have enjoyed impunity, protection of private property. Is the snow private? Is the wind, is the river private?" asks a proclamation signed by the Mapuches, who say they will never give up this land. The CTSA company was founded in 1889 when the Argentine government ceded land to 10 British citizens, with 90,000 hectares going to each one, bypassing the Mapuche communities who lived there, and who ended up as labourers on the new ranches, Leleque among them. "From the world view of the Mapuche they have rights. The problem is that the land was divided more than a century ago amongst individuals. In other words, it's not government land," Gonzalo Sánchez, author of the book "La Patagonia Vendida" (Patagonia for Sale). With the purchase of CTSA, Benetton then had 970,000 hectares in Patagonia, and is the top private landowners in Argentina. In 2002, the Mapuches Atilio Curiñanco, Rosa Nahuelquir and their children occupied Santa Rosa, convinced that it was government-held land. But the company, which used the land for forestry, denounced the invasion, and the police violently removed the Mapuches, destroying their humble home and their crops, and dispersing their livestock. The Indians faced criminal charges for misappropriation and a civil case arising from the land conflict. In the legal process the judge ruled lack of blame for the accused, but on the civil side resolved that the land belonged to Benetton. "Every time they bring native peoples like us into the supposed legal context it's to our detriment, but we have arguments to support us," said Millán. Since the expulsion, actions took Curiñanco and Nahuelquir to Italy in 2004, accompanied by Adolfo Pérez Esquivel, the Argentine Nobel Peace laureate (1980), who organised an interview with Luciano Benetton. After that tense meeting in Rome, the business executive promised to look for a solution to the conflict. Months later, Benetton offered the Chubut provincial government 7,500 hectares in Piedra Parada, located 200 km from the Leleque ranch. The idea was to set aside the land for the Mapuche families to farm, but the offer was rejected. "The Chubut government determined that they were unproductive lands," said Paula Vázquez, of the international consultancy Burson Masteller, hired by CTSA for public relations. "It's true that it would need investment, but the land could be forested and used for raising sheep," she told Tierramérica. Curiñanco and Nahuelquir are back, with other families from their community, camping on the land they believe was their ancestors'. Benetton offered to make a donation. "But neither is it our responsibility to recognise ancestral rights over lands acquired from a private company," said the spokesperson. According to Millán, "the donation was to clean up Benetton's image, but they never proposed anything to us directly. Piedra Parada is rich in archaeological sites, a wonderful and fertile place, but it only ended up expanding the company's immense holdings. "The Chubut government, from which the Mapuches are demanding inclusive policies, has washed its hands of the matter. "We're not intervening because we are not involved. It's a conflict with a private company," an official who requested anonymity told Tierramérica. Benetton mulls action against expropriation in Argentina. BUENOS AIRES (MarketWatch) -- The Benetton family is considering action against the attempted expropriation of part of its land in Argentina's Patagonia region by two indigenous families, Benetton's Compania de Tierras Sud Argentina S.A. said in a statement late Thursday. The statement follows the declaration made earlier this week by Argentina's land secretary Luis D'Elia about his intention to support the bid by the Curinanco and Nahuelquir families, both of which are of Mapuche heritage. The families are seeking the restitution of 525 hectares in Argentina's southern Chubut province owned by the family behind the famous clothing company, Benetton SpA (BNG). "We have learned about the situation from the media and we are currently conducting a deep analysis and defining the company's reaction," said Compania de Tierras, which manages Benetton's 900,000-hectares property in Southern Argentina. "Given the potential seriousness involved, we are following the matter very closedly and whatever position to be adopted by the company will be discussed by the shareholders in Italy," the statement added. Compania de Tierras is controlled by the real estate unit of the Benetton's family holding company, Edizione Holding SpA, which controls 67% of Benetton SpA. State-run newswires Telam on Wednesday quoted D'Elia as saying that the government "won't do anything reckless" against the Benettons. However, when the government makes a decision on the matter, "its action will be very effective," D'Elia said, adding that the government appointed a legal team to study the case in order to be as precise as it has been in its action against the U.S. garment mogul-turned conservationist, Douglas Tompkins. Last month D'Elia presented a bill to Congress seeking to expropriate a wide swath of land owned by Tompkins - who founded the U.S. apparel maker North Face - alleging that his property in Argentina's northern Corrientes province controls a large freshwater source. In its statement, Benetton's Compania de Tierra noted that the fight over Santa Rosa, the contended property in Patagonia, had already been subject to litigation by the Curinanco-Nahulquier families in May 2004. At that time, the company say, an Argentine court ruled in favor of the Italian family. "The judge's ruling was based on the evidence of the property rights provided by Compania de Tierras," the company said, stressing that the families who are now seeking that land's restitution never appealed against this ruling. Compania de Tierras said it will inform the press when it will take a decision about its further action. The Benetton's fight against expropriation in Argentina comes amid other battles that Edizione Holding is fighting in Italy, both as the major shareholder in Italy's highway operator Autostrade SpA (AUTO.MI) and in Telecom Italia SpA (TI), which it owns via the unlisted holding company Olimpia SpA. Both Autostrade and Telecom Italia are currently in the middle of a major transformation attempt, which are being blocked by the Italian government. Autostrade is seeking to merge with Spain's Abertis Infraestructuras SA (ABA.MC) while Telecom Italia is attempting to spin off its mobile arm and to possibly sell it. MAPUCHE NATIVES DISPLAYCED BY BENETTON. 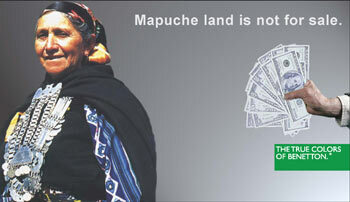 Mapuche natives lost a law case against the Benetton group for the occupation of land. Translation: Sandra Sanmartin Mellado and Norma. A Mapuche family from Chubut (Argentina), lost their case in a trial initiated by the Italian Benetton group over land in Patagonia. The Mapuche natives occupied land that belongs to the Compañia de Tierras Sud Argentino (South Argentinean Lands Company), owner of 970.000 hectares in the area, and controlled by the Italian corporation of Benetton. After that, they were moved off, but the case was in a penal procedure, and now the Mapuche lost the trial for the occupation of lands. “The law is for the huincas (white people). For us the democracy never came”, said Mauro Millán, indigenous leader from Argentina, after the judicial sentence which restitute 300 hectares to the Italian Benetton group, earlier vindicated for a Mapuche family, according to the information from the Argenpress agency. Justice failed against Atilio Curiñanco and Rosa Rúa Nahuelquir, a Mapuche couple who occupied the land in 2002 with their four children’s. The Mapuche family had requested a petition to the Institute Autárquico de Colonización IAC from Chubut (Autarky Institute of Colonization) to occupy a fiscal territory in the area that their ancestors inhabited. After six months of procedures without an official answer, they decided to occupy a piece of land. They ploughed and sowed the earth, repaired some fences, raised cattle and built a precarious house. According the Curiñancos, who send a written project to the IAC. The IAC unofficially authorize them to move into the land in August 2002. But two months later, twelve policemen, armed and with dogs, enter the land, in the Leleque area, and evacuated them, arguing that this belongs to a farm of the Benetton group. The corporation started legal proceeding against the family because they stood against the being removed. They also initiated another lawsuit in order to define the ownership of the land. The Curiñanco-Rúa Nahuelquir family rejected the attempts of an extra judicial agreement initiated by the company. Alberto Mazzucchelli, the company spokesman, maintained that “now the national and provincial government has to work on the housing problem of the Mapuche community. We are a corporation that grants job opportunities mostly”, he emphasize. “The Argentinean Mapuche communities were cornered and pushed to live in the worst part of the region. They are just allowed to occupy a place owned by the government, but there is no assistance to make the formal procedures for a definitive ownership as the Provincial law indicates”, explained Gustavo Macayo, defence attorney of the Curiñanco-Rúa Nahuelquir family. 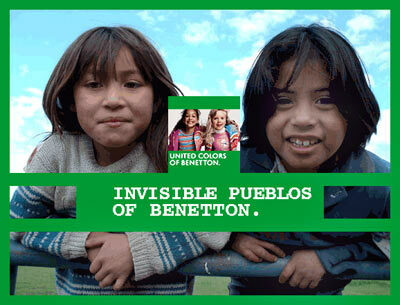 Mapuche Tribe Fights to Remove Benetton From Homeland. (Bloomberg) -- Benetton Group SpA, the Italian apparel maker whose advertising celebrates diversity, is being accused by Argentina's Mapuche Indians of trying to bury the tribe's heritage. The dispute pits the survivors of Indian tribes whose lands were seized by the government in 1878 against a company whose advertising conveys a commitment to social issues and racial equality. Campaigns to publicize the United Colors of Benetton brand included images of condoms of different colors and a white baby nursing at a black woman's breast. Benetton, which obtains 20 percent of its wool from sheep grazing on the land in Patagonia, says the Mapuches are utilizing the company's name to grab attention in a long-standing dispute that extends beyond its lands. A. Roca, who later became president of Argentina, led the government troops. The Mapuches have been impoverished and nomadic rural workers since, eking a living from agriculture and cattle. The seeds of the current dispute date to 1991, when Luciano Benetton bought the land from Compania Tierras del Sud Argentino SA, becoming one of the biggest landowners in Argentina. The company raises 16,000 head of cattle and 280,000 sheep. It produces 1.3 million kilograms (2.9 million pounds) of wool annually. Last year, Benetton was Argentina's largest wool producer. grow vegetables. Police enforcing the judgment tore down the couple's house and confiscated their oxen and plough. Benetton made an overture to the Mapuches, offering Esquivel 2,500 hectares of land in Patagonia two days before a Nov. 8, 2004, meeting of Nobel laureates in Rome. Esquivel turned it down, saying he couldn't assume responsibility for land that belonged to the Mapuches. This month, Benetton raised the offer to 7,500 hectares, or 0.7 percent of the company's total holdings, a donation that it plans to make in January, channeled through the Chubut provincial government. ``The gift is a symbolic gesture of social responsibility,'' the company said in a Nov. 16 statement. Benetton set up a Web site, http://www.benettontalk.com , this month to discuss issues raised in the dispute. The site says the company has made several goodwill gestures toward the indigenous communities. In 1997, the company invested $800,000 to set up a museum of Mapuche history in the village of Leleque in Chubut. Italian textile tycoon Luciano Benetton announced Wednesday the donation of 7.500 hectares of land to Indian communities in Argentine Patagonia. “We’ve opted for a concrete quality and quantity contribution”, said the businessman. The Benetton group will cede the land to be distributed among Indian communities, to the provincial government of Chubut in Argentine Patagonia January 2006. The group which acquired 900.000 hectares of land in Patagonia has been involuntarily involved in a long historic dispute dating back to colonial times between the Mapuche nation and the Argentine government. However Argentine Nobel Peace Prize winner Adolfo Perez Esquivel has consistently claimed that the Benetton group “usurped” territory from the Mapuche Indian. “You have taken advantage of your money and the complicity of an unscrupulous judge to deprive land from humble Mapuche families”, said the Argentine human rights campaigner who was awarded the Nobel Prize in 1980. A contentious involving 385 hectares out of a total 900.000 purchased to the Argentine government was favourable to the Benetton group. Mr. Perez Esquivel argues that the Mapuches are the “legitimate proprietors, even when they don’t have the documents crediting possession”. Benetton invited Perez Esquivel to talk about the issue and rejected the “feudal lord” adjective used by the human rights activist. “Our investment in Patagonia represents a challenge for us which will contribute to develop the region and create jobs for its inhabitants”, said Mr. Benetton. “We believe in economic rules, in enterprises, innovation and favouring development, not in feudal rights”. The Benetton group purchased the land originally belonging to three families in 1991, but in 2003 a family of Mapuche Indians occupied 400 hectares claiming they belonged to their ancestors. The court ruled eviction of the Mapuches but also triggered the controversy with Perez Esquivel. The Mapuche nation number a million most of them living in Chile and an estimated 60.000 in Argentina. Since Europeans arrived in Patagonia the Mapuches have been persecuted and their land forcibly disputed when not confiscated even as recent as during the Pinochet dictatorship. The Benetton episode on the Argentine side partly compensates losses but not legitimate rights as Mapuches demand.